As an Atlanta native, I always find it interesting to read lists of places or activities which characterize denizens of the city, many of which I have little or no familiarity with. Lenox Square Mall, for instance, is cited as the place Atlantans shop, but it wasn’t until I was in high school or college and driving places on my own that I went there on a regular basis, and then it was largely to buy records. Living in West End and East Point, I frequented Lakewood and Greenbriar Malls, later Southlake, and, to a lesser extent, Shannon Mall. The same is true of Buckhead, where I didn’t hang out regularly before mid- to late-college. Virginia Avenue and Old National Highway were the party spots for my friends and I in high school. To the best of my knowledge, I have never been inside the Clermont Lounge. At the time I’d have been most likely to go, in college in the eighties, that part of Ponce was considered very dangerous, particularly for foot traffic. I also cannot recall eating at the Mary Mac, even though I’m distantly related to the family of the former owner of it and despite the fact that I have been to the Krispy Kreme doughnuts across the street. Living south of town, it always required a special trip to get to that part of Atlanta, and there were lots of southern style eateries in between. When I was born, Carl Sanders was governor of Georgia and Ivan Allen, Jr. was mayor of Atlanta. It was against the law for blacks and whites to eat in the same restaurant in town; desegregation didn’t happen until July of that year. In sports, the Atlanta Crackers was the main professional sports team in town. Within my lifetime, Atlanta acquired the Braves, the Falcons, and the Hawks; acquired then sold the Flames and Thrashers. Atlanta-Fulton County Stadium was built, then demolished, as was the Omni. I also experienced first hand the “white flight” of the early- to mid-seventies. While not much of a sports fan, I followed the Braves as a child. Despite all their success in the nineties, in my youth the team had a reputation for being lovable losers. They had great individual players such as Dale Murphy and Phil Niekro, but were rarely able to pull together enough wins as a team to make it to the post season. I attended games in the seventies where we were happy if they won that particular game, let alone the pennant. An entire generation of Atlantans has now grown up with the Braves as the powerhouse contenders they were throughout the nineties. Growing up in Atlanta, I learned not to get too attached to specific places because they might not be there next time I visited. The Atlanta that people who relocated here in the seventies remember was built over top of the Atlanta I knew as a young child. At one point, the Polaris restaurant, the blue dome at the top of the Hyatt Regency, was one of the tallest structures in the city; now, one must be downtown to see it. Whenever I was traveling South on Peachtree Street in high school or early college, I frequently used the Coke sign at the intersection of Ivy Street to navigate. Once, I got a friend home from there to East Point within ten minutes, despite the traffic. Now, not only is the Coke sign no longer there, Ivy Street was renamed Peachtree Center Avenue in the nineties. I attended Georgia State University from 1982 through 1987 and usually commuted by bus, as the south line of MARTA was under construction during that time. Before I graduated, Lakewood station opened and my bus, 72 Airport, was rerouted there. At the time, GSU was confined to the central campus downtown. We didn’t have a football team, and the basketball program wasn’t much to speak of either. There were no dorms, and the now heralded law school was in it’s infancy. Since I graduated, the university has expanded throughout the city, has a football program and the campus downtown has added numerous buildings either through purchase or construction. Riding past it on MARTA, I’m still able to recognize most of the campus but there are many new buildings I don’t recall from my time there. I moved to New York in 1989 and moved back to Atlanta in 1994, two years before the Olympics were held here. In those five years, in preparation for the Games, the city changed greatly. Streets were renamed, businesses closed, buildings were demolished and replaced by new ones. MARTA completed the line out to the airport and rerouted, renamed, or discontinued several bus lines I had used. Even though I visited during the holidays, I wasn’t spending much time traveling around mapping out how the city was changing. By the time I got back and started looking for work, I hardly recognized the place. When I left, for instance, Rio Mall had just opened with much fanfare, and by the time I returned, it was already in decline. Once the Games were over, many of the sporting venues were packed up and moved elsewhere. People who knew me around that time found it amusing that I’d sometimes get lost navigating around town, mainly because of all the changes to a city that was already difficult to navigate in the first place. I served as president of the Atlanta Junior Chamber of Commerce, or Jaycees, from May, 1997 until April, 1998 and in my plan for the upcoming year, I noted that one of the problems we faced in maintaining a community service organization in Atlanta was the transient nature of our population. Most members at that time had been in town less than five years and would not be here five years after. Most were unmarried, apartment or condo owners, with no solid connection to the community. Most were upwardly mobile professionals, who spent a lot of time at work and in their off-time didn’t want to manage projects, an activity which characterizes many Jaycee chapters. When I joined, I heard the chapter referred to as Atlanta’s largest dating service, and found this to be an apt description in some respects. Our members were more interested in social outings which introduced them to places or activities where they could unwind, enjoy themselves, and meet new people. While we did have a contingency of members with roots in the community, and those who were interested in community service, this did not represent a large segment of the membership. A fair number of people attended a function, joined the chapter, and afterward we never saw them again, or they joined, became active, then were relocated by their employers to another town. Needless to say, membership turnover was always a problem. 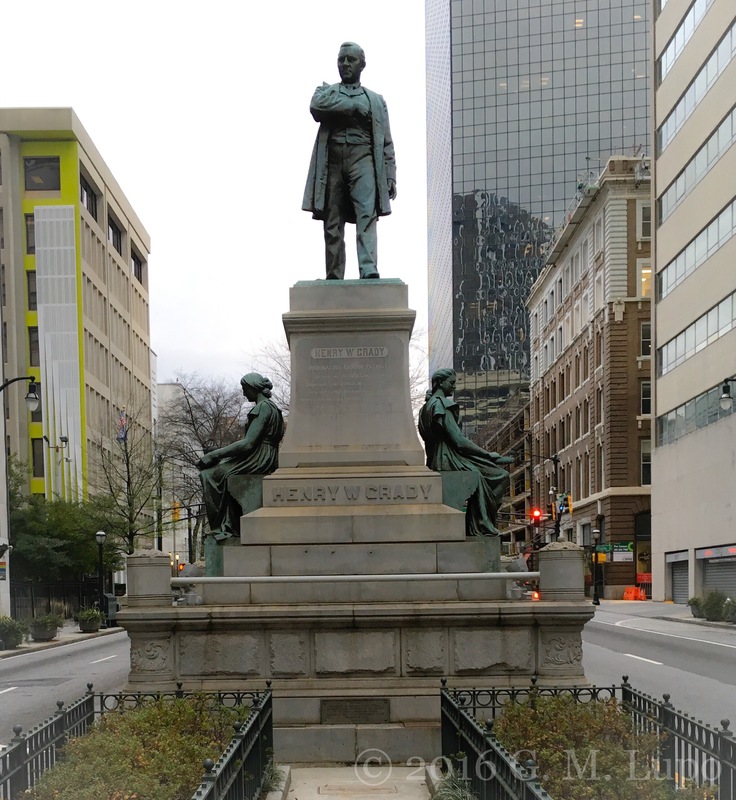 Statue of Henry W. Grady, Marietta Street at Forsyth. 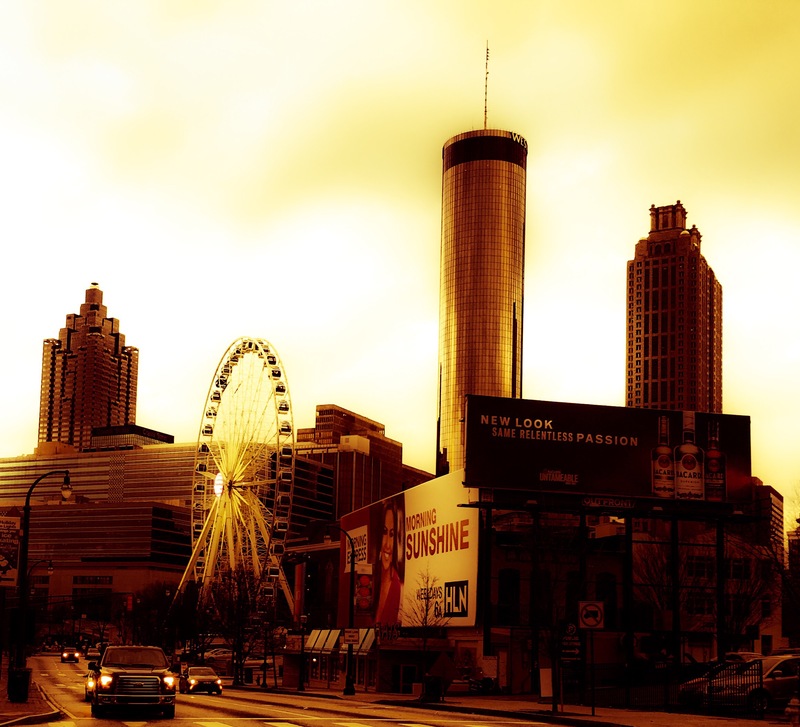 Transition has always been a central part of Atlanta’s story. Perhaps the most infamous example of this was in September of 1864, when Sherman’s troops set fire to it as they were beginning their march to the sea during the Civil War. At that point, the city was not much more than the confluence of rail lines which made it an important transportation hub. Now three major Interstates converge in downtown Atlanta and its airport is the busiest in the country. In his speech, The New South, Henry W. Grady extolled the virtues of Atlanta, “…we have built a brave and beautiful city; that somehow or other we have caught the sunshine in the bricks and mortar of our homes, and have builded therein not one ignoble prejudice or memory.” Very good propaganda for northern financiers looking for reliable investments. It also highlights Atlanta’s place as a slightly different southern metropolis, the cultural and economic regional hub it would be for the next hundred plus years. Looking at archival photos of Atlanta throughout its history, one is immediately struck by its radical transformation throughout time; from the railroad lines which gave Five Points its name to the sprawling economic center which gobbled up its former suburbs as it expanded. When I was in high school, people in Marietta and Sandy Springs bristled if one said they were from Atlanta and now, people born there regularly claim to be native Atlantans. With the influx of outside the perimeter (OTP) folks into town, not to mention transplants and immigrants from all over, the development of the Beltline, and the rise of the film industry in Georgia, it seems the only constant in Atlanta is change. I enjoyed this so much. I’d like to share with my old friend who’s father won a Pulitzer for the AJC and also covered the Winecoff Hotel fire; my friend later writing the book on the fire. His name is Allen Goodwin. He would enjoy following you having been born, raised, and still here. By all means! Please share. My mother once lived at what she called the church’s home for girls when she first moved to Atlanta and said one of her roommates survived the Winecoff fire. I was born here a half-generation or more before you. I lived in College Park – and went to school at GMA so I know and recall the places you mention. Before that I rode the trolley (5 cents each way) to Rich’s, could buy 3 cigarettes for 5 cents at Pup’s soda shop on Main St and Rugby. Atlanta Federal was the tallest building at 22 stories – I went to the Grand Opening of it and Jekyl Island and Stone Mountain park. We were astounded when the Eisenhower administration said we needed a 4 lane “interstate” highway through town: we already had Peachtree St and US 29. “White Only” water fountains were still around. There were no – zero – places to eat out after church south of downtown where we could go to eat at Pilgreen’s. Then a “Huddle House” was built, then a Shoneys, and we were set. My family settled in what was Campbell – now Fulton – County in 1804 when my GGGGrandfather met a Cherokee Indian woman when he was headed to Texas from N.C., fell in love, and stayed. We have been born here every generation since: from Fairburn and Palmetto to Union City and College Park. Thanks for the reply, John! I don’t recall eating at Pilgreen’s before after I was out of college, and that was at a location in the Southlake Mall area, but I know of lots of people who’d go there after church to eat. My family’s from all over Georgia. Both sides go back at least six generations, except for my mother, who was born in West Virginia, after my Georgia born grandfather traveled there long enough to meet my grandmother and produce my mother. He didn’t stick around. I have an article on him which can be accessed under the Family link at the top. Once someone told me they went to a party and they had real southern Atlanta food. I asked what. They said shrimp and grits. I told them we don’t eat shrimp and grits in Atlanta and we sure don’t eat grits at a party. They just looked at me like I was really sad. Like I must be confused. Then someone else told me they had chicken and waffles at a restaurant. I told them I’ve never had chicken and waffles. They laughed and asked how I could be from Atlanta and not have chicken and waffles. Where the heck do you get chicken and waffles. They looked at me really sad too. Turnip greens, beans, cornbread, sweet tea, fried chicken and banana pudding. Nough said. I didn’t hear of chicken and waffles until late college, maybe even later and first encountered shrimp and grits at Cajun restaurants in the 90s. I’ve made those at home, though. I think each wave of transplants brings their own culinary traditions with them, and as they become entrenched, people come to regard these as native delicacies. I also grew up in Atlanta. My family moved to Atlanta in the early 1940s. As a kid, I recall going to the Atlanta Crackers baseball games on Ponce de Leon, across the street from the large Sears building. I also went to Georgia State College, prior to its name change to a “University”. In addition, I attended and later worked at Georgia Tech and went to the “Varsity” drive in restaurant on North Avenue many times. There were several downtown movie theaters,within close proximity of each other in the 1960s, including the Lowe’s Grand, the Paramount, Rialto, and the Roxy theater (next to Davidson’s department store). These were all within several blocks of each other. I remember attending an Elvis concert, early in his career, at the Paramount theater. There were also numerous neighborhood theaters, such as the 10th Street theater and the Empire theater on Georgia Avenue. Further down Peachtree street was the Fox theater, where on weekends in the evening, a large organ rose from the stage and played during an intermission between showings of a movie. In the 1950s and 60s, Lenox Square Mall was smaller and was called Lenox Plaza. The main shopping area downtown was Rich’s department store with its annual Christmas tree lighting event. There were numerous small retail stores on Whitehall street at that time. Muse’s was one of my favorite men’s clothing store near “5 Points”. During that time, Atlanta was a great place to be and growing up in the city was a fun time. Thanks, John. I remember Muse’s. My grandmother used to take me downtown and we’d eat at the S&S cafeteria and visit Rich’s on occasion. I loved this. I’m a second generation native (for real-I was born at Georgia Baptist, and my mother was born at Crawford Long), and you beautifully express my experience. I’m a wee bit younger than you, and the Braves and the Falcons both came to town the year I was born. I use that as a measure of how the city has grown since I was born. I think Atlanta in the 1950s and 1960s was still a small town, but now it’s a big city, and I’ve seen that change happen. Three generations of my family lived in Atlanta, but I’m the first Atlanta native in the family. growing up in East Point we used the term trolley line as I used to hear my parents say. Riches store and the only sporting goods store was our usual destination. As a kid, we did not have a car. Yes, my mother used to refer to riding the trolleys also. My grandmother continued to refer to the buses as trolleys. Some weekends, we’d catch the trolley to go downtown. My grandparents had a farm that was near Stewart Ave in an area called Capital View. They farmed 60 acres where Atlanta College is located. He later owned the Farmers Market on White Hall Ave in southwest Atlanta. My parents married in 1929 and went to Macon on their honeymoon. They bought a house in East Point where my mom lived for sixty years before she passed in 2010. What a great place to grow up! I was born there and lived in Atlanta till 1990 and have since moved to Des Moines, St Louis and rural North Carolina. When I visit Atlanta after being gone for over 25 years it’s like visiting a foreign country that looks vaguely familiar. I am a decade older than you but I felt we traveled the same roads including the GSU time(class of 74). Nicely done! Thanks, Doug! I was in the Boy Scouts in the 70s and we met in Capital View, so I was familiar with that area. In the 90s, while I was in the Jaycees, we volunteered at whichever of the PBS stations had their headquarters at Atlanta College.